This entry was posted in Uncategorized and tagged Germany, Gotz, no mold line torso, ochre eyes, Sasha by mountainmullins. Bookmark the permalink. What a gorgeous red haired girl Cathy is and a lovely new sister for Little Dawn. I am sure they’ll have a great time getting to know each other over the coming months. Oh wow Ginger, she is amazing! I love her so much she is gorgeous!!! What a lovely new addition to your family at Shangri-la . The two girls look like the best of friends already. She looks very special. What a wonderful girl and a wonderful family to be joining. GOSH! Another NEW girl arriving over there….DARE??? 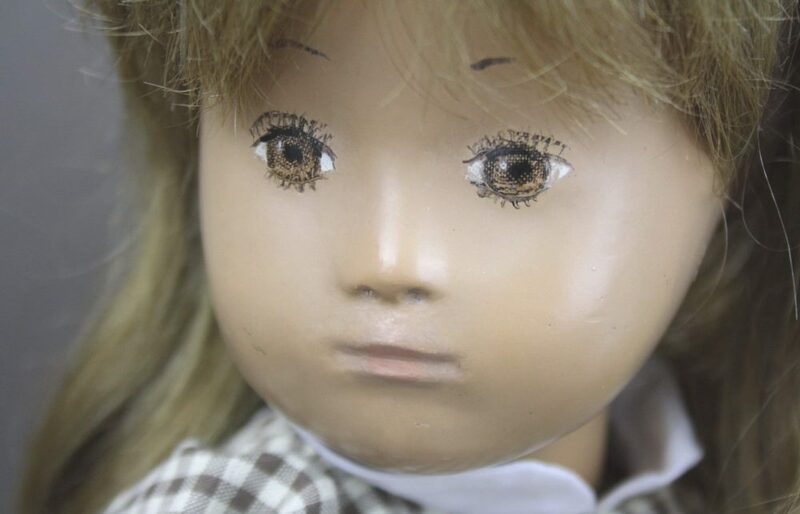 I ask just how many Sasha Dolls you have ALTOGETHER in your collection….or had I better NOT? What a simply delightful Gotz girl Cathy is with her unique and so individual expression and I love how you have named her after her previous mother. I don’t think that I have ever owned such an early no-mould torso doll or if I have I was completely unaware at the time and can’t check as such because all my ex three have since moved on. Yes, that is definitely a vintage-sasha outfit! I’m always in awe of Sarah W’s work. Her ‘craftsmanship’, fit ,designs and use of exquisite materials is IMO nothing short of a Sasha Guinness book of records. Was pleased to see that you (well rather Little Dawn) remembered the welcoming soft toy this time as well as the waterlogue photo at the end. I shall really look forward to your future post on the yellow eyed girls after your forthcoming exciting visit to the SCW! Many thanks girls for your good wishes for the coming week. We are certainly very busy getting ready for that special Sasha weekend, coming up far too quickly now. What a lovely lovely girl Cathy is Ginger 🙂 I love her pouty chubby cheeks and her beautiful golden eyes, she makes the perfect addition to your Sasah family at Shangri La. I didn’t realise that it was only two weeks until you go to the UK, time passes so quickly! I expect you’re very excited!!!! I particularly love the photo of the two girls holding hands, how sweet is that! Have a lovely week Ginger. Oh my GOSH! I really can’t get over how different see looks Ginger! Her surroundings and new friends are working their magic on Cathy. She looks……..healthier actually. I have never noticed this in my own photos of her, but she has amazing smaller eyes which appear slightly far apart. At first I thought it was simply because she was standing next to her slate eyed sister Little Dawn, but I can see this in the photo of just her. I would very much love to see comparison photos of Cathy along with your other early ochre eyed girls. Thank you so much for adopting Cathy. Gorgeous girl Ginger! Have you decided who is accompanying you on your trip? I must write your travel partner before your trip to the Sasha Celebration to find out when you leave, but my memory is that it’s in about two weeks. I know you and Ann will have a wonderful time. Just make sure she watches her feet when you both walk on uneven pavement, such as cobblestones. I once had a Gotz who could have been Little Dawn’s twin, but that was in my early Sasha collecting days. Since she no longer had her original outfit, I sold her to upgrade to an all-original sixties Gotz who has never tugged at my heart strings as strongly as the one I sold. Whenever I’ve sold, and that hasn’t been often, I’ve always been reluctant. Many of the nineties Gotz, however, have not caused the emotional attachment of my earlier Sashas. Your Cathy, though, is a beauty and has a good personality. I’m sure you bonded with her immediately. I’m sorry I’ve been so out-of-it the two latest times we run into each other. It hasn’t been because of my feelings toward you, I promise. I’m in a lot of pain from my back and it doesn’t take much before it practically turns me into a zombie. On both occasions, I had recently taken a pain pill and wasn’t at my best, if I ever do feel well oiled anymore. Hi Anne! Thank you for your lovely note. You are correct, two weeks from today I will meet Ann in Boston to begin our wonderful trip to England. I am so excited to be able to meet friends that I have only known through Facebook. I am certain Ann and I will enjoy our time very much.